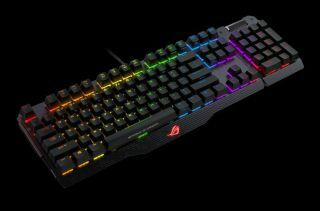 Asus today announced its ROG Claymore, the first mechanical keyboard to combine RGB backlighting with a detachable number pad. Granted, claiming "First!" is a bit of a technicality here—Gigabyte's Aorus Thunder K7 also sports a detachable numpad, but it doesn't have RGB backlighting—but it's one Asus is ready to capitalize on. The benefit of a detachable numpad is that you can toss it aside when gaming to make more room for your mouse, and then slap it back on when it comes time to do the taxes. In this case, you can also relocate the numpad to the left side of the keyboard and use it as a set of macro keys. So, that's a total three different orientations: right-side placement, left-side placement, and detached for a tenkeyless experience. For anyone who's absolutely certain they'll never make use of the digit keys, gaming or otherwise, Asus also sells aversion without the numpad called the ROG Claymore Core. Both versions feature a choice of Cherry MX key switches, those being Cherry MX Red, Blue, Brown, and Black. If you're not familiar with mechanical key switches, check out our guide on the topic, as each type has a distinct feel and sound. The keys are individually backlit and can be customized independently of one another, or users can choose between nine preset lighting effects. Users are also able to sync the ROG Claymore and ROG Claymore Core with their Asus motherboards and graphics cards for some neat lighting effects, such as having backlit keys reflect CPU or GPU temps. Outside of backlighting, the keys are fully programmable and support on-the-fly macro recording. There's enough onboard memory to store personalized settings in up to five custom profiles, plus there's a default profile. On top of that, they keyboard can track statistical data such as the total number of keystrokes during a game session, if you're into that sort of thing. Asus first showed off the ROG Claymore and ROG Claymore Core at CES earlier this year. Today's announcement says "the wait is over," though that's only true on the part of Asus. As of this writing, online vendors have yet to update their product inventories. That also means there's no word yet on price.